NASA's Mars rover may have just solved the mystery behind a massive Martian mountain whose base it is currently exploring. According to a new study published Jan. 31 in the journal Science, the Mars mission team may have figured out how a huge mountain on the Red Planet's surface called Mount Sharp may have formed. They apparently found that the structure was the result of the deposition of windblown sand and sediment. In order to reach this conclusion, they measured tiny variations in the gravitational fields using the Curiosity rover's navigation gear. The study's lead author Kevin Lewis, an assistant professor in the Department of Earth & Planetary Sciences at Johns Hopkins University in Maryland, told Space.com that this new strategy could be used during explorations of other planets as well, especially to learn more about their subsurface. "Going forward, I think this study shows the promise of making gravity measurements on the surfaces of other planets," Lewis said. "It really gives you data about the subsurface, which is hard to get from any other instruments," he added. Mount Sharp apparently intrigued scientists because it protrudes 3.4 miles (5,5 kilometers) towards the sky from the center of the Gale Crater. There is no geological occurrence like this on Earth. Its formation also baffled scientists who previously wondered whether it initially covered the entire crater and just eroded with time. However, the new study finally puts to rest the mystery behind how this mountain formed. Using the fact that gravitational fields weaken as altitude and distance from a planet's core increase, Lewis and team mapped out the gravitational field strength at more than 700 points from where Curiosity landed on the crater's floor up to where it had traveled into Mount Sharp's foothills. These "gravimetry" measurements were then used to determine the density of rocks the Curiosity encountered. They calculated a density of 1,680 kilograms per cubic meter, which is considered to be low. This means that the rocks are porous. 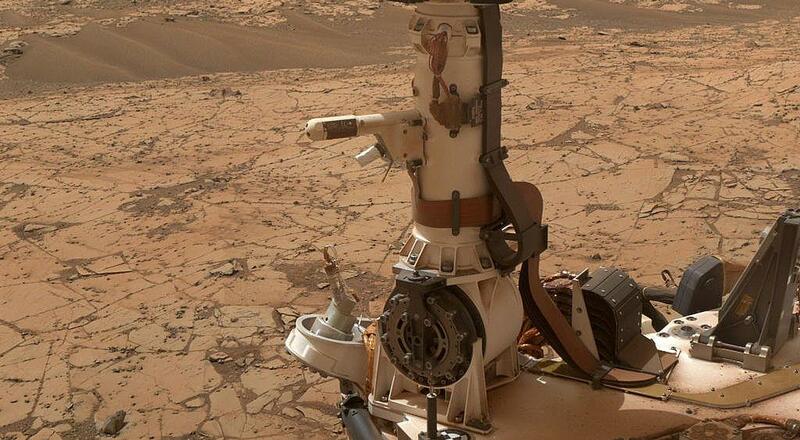 "What we were able to do is measure the bulk density of the material in Gale Crater," Travis Gabriel, a graduate student in ASU's School of Earth and Space Exploration, said. "Working from the rocks' mineral abundances as determined by the Chemistry and Mineralogy instrument, we estimated a grain density of 2810 kilograms per cubic meter," he said. "However the bulk density that came out of our study is a lot less -- 1680 kilograms per cubic meter." Since they are not very dense, scientists believe the deposits had not been previously buried under 3 miles (5 kilometers) of other sediments. Based on this, the mountain could not have been a larger one that eroded, but more likely built up by windblown deposits. After arriving at Mars' surface in August 2012, the Curiosity rover has been observing and gathering data while searching for potential signs of life on the Red Planet, starting with the 96-mile-wide (154 kilometers) Gale Crater. Aside from new data about Mount Sharp, the spacecraft also found that the Gale crater previously had a stream and lake for long stretches, perhaps hundreds of millions of years at a time. Could Life On Mars Be Found Underground?